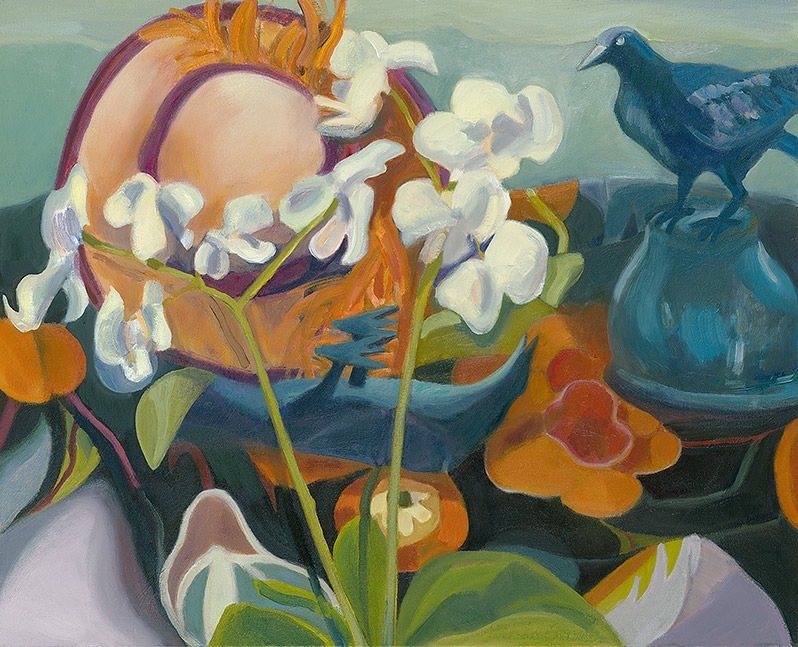 The inspiration for this exhibit came from an exhibit many years ago entitled “Four Artists, four Objects, Ten Years.” The four artists were Sondra Freckelton, Harriet Schorr, Nancy Hagin and Janet Fish. These artists each selected an object that they passed around to one another, each using the collections of the objects to compose a still life. They repeated this process twice over a ten-year period. 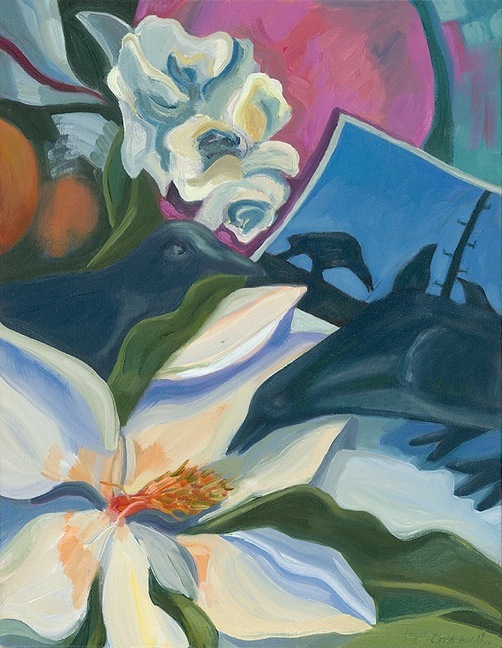 Sally Baker (whose mentor for the last thirty years has been Sondra Freckleton) invited her artist friends, Marsha Connell and Micah Schwaberow to create a similar exhibit in a shorter period of time. 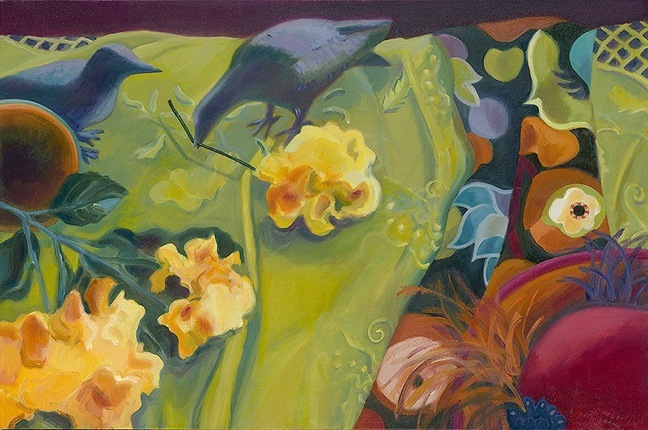 Their project began with a trip to Chinatown to find identical objects that they would each use to create a set of three still lifes, independently. First, that each artist would create 3 pieces (one large, one medium, and one small). Second, that each item must be in each piece. Third, that other objects could be included in the compositions. Fourth, they agreed not to see each other’s work until completion. A surprisingly challenging part of the project was in the selection of the objects, as Sally, Marsha, and Micah use such different mediums and styles, and they kept finding unique objects that didn’t come in threes! 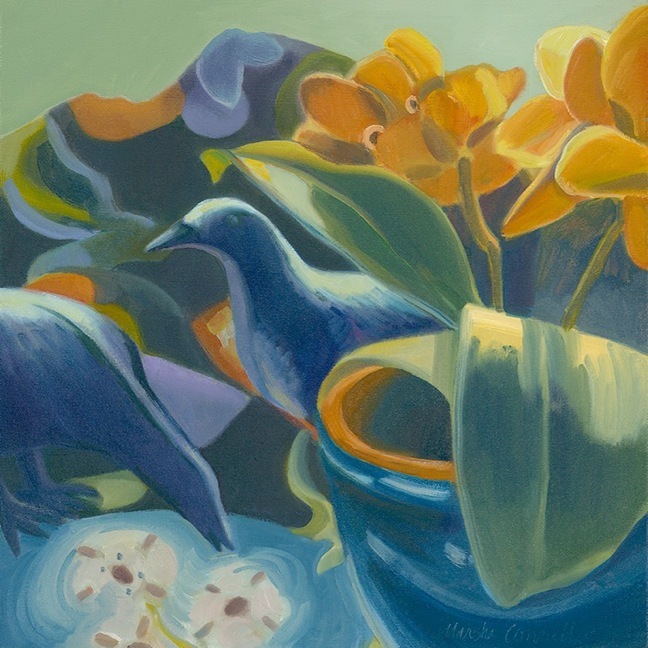 After several shopping trips, excursions, various discussions, lunches and dinners, and lots of laughter, they finally agreed on a pair of crows, a ceramic pot (with or without flowers) and a swath of tapestry fabric. Thank you, Natalie! As the Hokusai painting found its form (not yet named), I noticed that the tapestry fabric had taken on the shape of Mount St. Helena, that I knew so well from living these many years in Sonoma county and from my drawings and paintings of her many aspects seen from Pepperwood Preserve. . .which recalled Hokusai’s great series, “36 Views of Mt. Fuji”. . .an inspiration for seeing, and re-seeing how everything is in relationship. 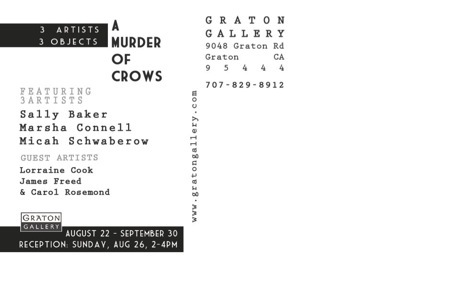 I love the concept and the outcome of “The Murder of Crows” . It must have been a fun project for you in collaboration with your artist friends. 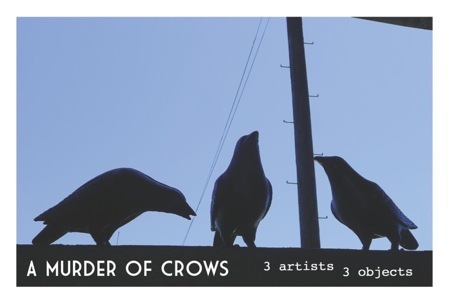 Crows are an interesting symbolic subject and I’m intrigued by their intelligence and sense of play. However, I’m equally frustrated with them as they have learned to pull up the plant markers on our farm and mess with my system! Marsha, I’m very impressed with your new blog and it has inspired me to consider constructing one for Cinnamon Bear Farm. I look forward to viewing updates at Marsha Connell Studio.